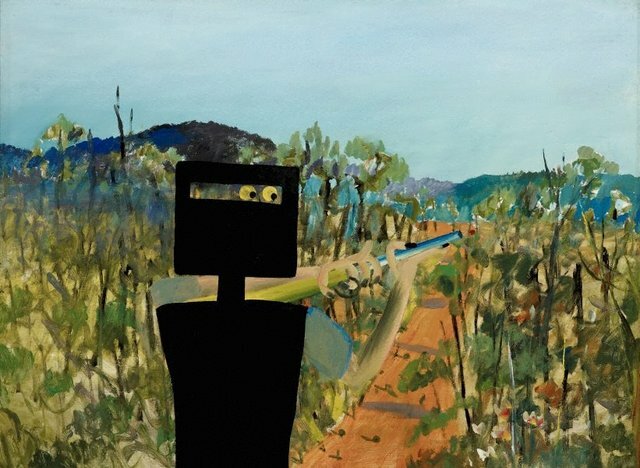 'First-class marksman' shows the isolated figure of Ned Kelly in the solid black armour that is Nolan's most inventive pictorial device, its flat abstracted shape incongruously placed against a landscape of lyrical delicacy. The title refers to an incident which took place in Victoria's Wombat Ranges, when Kelly and his gang were practising their marksmanship, firing hundreds of rounds at surrounding trees from a bullet-proof hide-out. Nolan made many paintings of the outlaw Kelly between 1946 and 1947 at Heide, home of patrons John and Sunday Reed. This was the only panel in the series not painted on the Heide dining table, but at the house of Russian expatriate artist Danila Vassilieff at Warrandyte, where Nolan was caretaker for two months. Its informal swift and transparent rendering is a precursor to subsequent series based on outback Queensland, such as 'Pretty Polly mine' 1948. Signed and dated l.r. corner, pencil "12.12.46/ N.".